Happy Boxing Day!Remember to tip your postal worker, newspaper boy, gardener, etc generously! 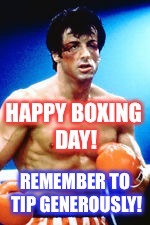 HAPPY BOXING DAY! REMEMBER TO TIP GENEROUSLY!